Royal Kahana 407 - beautiful 2018 remodel. 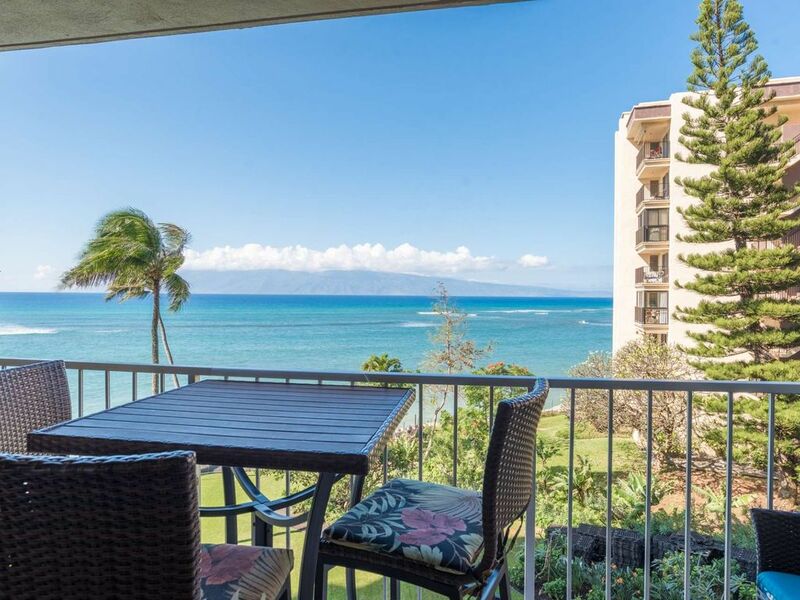 The true spirit of “aloha” awaits you at this highly desirable and sought after fully ugraded and remodeled one bedroom/one bath spacious air conditioned Royal Kahana condo. Upon first entering, you will be greeted by a breathtaking west facing panorama of the blue Pacific with the island of Moloka’i in the distance. * Tastefully decorated in an island theme. * Plenty of cooking and dining essentials to enjoy relaxing home prepared meals. The Royal Kahana complex is a time honored, well maintained and managed resort in Kahana. It is located between Ka’anapali and Kapalua on Maui’s west side. Guests here enjoy the swimming pool, gas BBQ’s, workout room, sauna, shuffle board, and ping-pong. The Royal Kahana provides complimentary WiFi and complimentary parking! Hawaii Department of Taxation: GE-080-999-6288-01 and TA-080-999-6288-01. Only disappointment is that there is no real beach left at the Royal Kahana. Impeccably decorated and maintained property with spectacular ocean views. All the comforts of home. We really enjoyed our visit to Maui and this lovely condo. Was lovely updated in kitchen, bath, new floors and new closet storage. I used the workout room which was very clean with 2 treadmills, recumbent bike and elliptical. Free weights available also. Lobby and hallways were always clean and neat. Pool are was great and pool was always clean. No shortage of chairs. We walked to Hawaiian Village Coffee almost daily. Walking distance to a sports bar, sushi and a beach bar. Great sidewalks for walking or running. Unit had every thing that we would ever need. Front desk was very friendly and helpful for directions and suggestions. Thank you for a great visit!! This property was perfect for our getaway. The ocean view was great and the property has everything you need. It is also newly remodeled so it is very comfortable and clean. The beach access was closed during our stay but we are Ok with it. I highly recommend this property for your next vacation! We had a great time in Maui. Very well equipped kitchen. Right in front of the ocean. Occasional rainbow viewing right from the lanai was cool. The place was very nice , it made you feel like home. Great ocean views and the owners respond very quickly to any question you may have .